The £34.3m Sheffield to Rotherham Bus Rapid Transit (BRT) scheme is facing the prospect of a 12 month delay and a near £8m cost increase due to "significant ground condition issues" at Tinsley. Initially programmed to begin in September 2015, a high quality, limited stop bus service is to provide faster, more frequent connections through the Lower Don Valley, reducing the snarl ups which occur at the busy junction of the M1. It will also help unlock the redevelopment potential of the area, which is being restricted by the traffic problems on the present road system. Transport bosses will hear this week that the project team have encountered several problems including the discovery of significant levels of asbestos which had not been identified in surveys carried out before work began. Until these are addressed it will not be possible to commence main works on site. A report to the Sheffield City Region Combined Authority Transport Committee states that "a worst case scenario for programme and costs, based on the current information has now been determined and has resulted in significant delay and cost increase. "The total delay to programme is currently 54 weeks. The increased project cost, accounting for savings from other work packages and use of risk allowance, is £7,903,000." This means that there is a funding shortfall of £5.7m and the project team is working on a funding recovery plan to close the gap and are working to identify funding sources. The Department for Transport confirmed a maximum of £15.9m for the scheme last year and contractors, Carillion began work on the Tinsley Link road in January. The scheme is being delivered in partnership by South Yorkshire Passenger Transport Executive (SYPTE), Rotherham Metropolitan Borough Council and Sheffield City Council. Other funding has come via the European Union's European Regional Development Fund through the Yorkshire and Humber ERDF Programme 2007-13, the Growing Places Fund from the Sheffield City Region Local Enterprise Partnership, local developers such as British Land, and the South Yorkshire Local Transport Plan. When bidding for funding, backers stated that it will help to unlock 4,000 jobs in the Lower Don Valley linked to schemes such as the River Don District, the Outokumpu site and areas of Templeborough. It includes areas benefiting from the Sheffield City Region Enterprise Zone. In addition to the new road, new bus lanes and improvements, such as those proposed at Ickles Roundabout and the junction of Westgate and Main Street, will give buses priority and help reduce total journey times to 20 minutes. From the interchange in Rotherham, stops are proposed for Westgate in the town centre and Bradmarsh Way and Grange Lane at Templeborough. 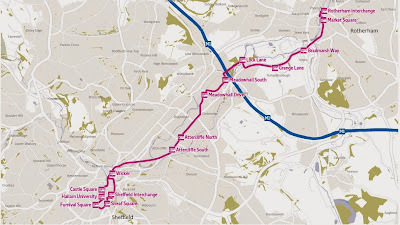 Proposals for the Southern Route of the BRT scheme, linking Sheffield city centre, Waverley and Rotherham, have not been firmed up after being knocked back by the government but future options for connectivity to Waverley and the Lower Don Valley are currently being considered.